"Busy" is an old dog. She was named "Busy" because that was what she was, busy. We'd say, "that little dog is so busy." So, that became her name. She was the only puppy of the litter smart enough to escape from the barriers the breeder had set up. This was a big mistake. 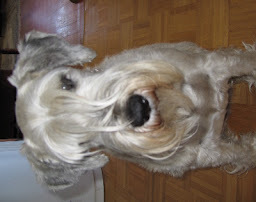 Busy is now 12 years old. And Busy has her routines. She is the timekeeper. 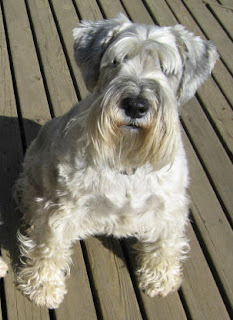 One of which is, No matter when the peep of dawn comes, Owners Must Be Woken Up. Another is: Owners must be accommpanied at all times. No matter if you move from one chair to another, Busy must get up and lay within a radius of 3-5 feet. This applies to bathroom visits as well. Repeat every 2-3 hours during the day. Simple enough for ya? Sheesh, Humans are so DUMB. 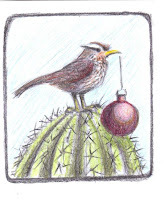 These little cactus wrens are scolding us at the back patio. Mizusashi referes to a large water jars used during the Japanese tea ceremony. (Mizu means 'water') Usually, but not always, they have black lacquer lids with a small loop on the top. When I visited Japan a couple of years ago, I was intrigued by the huge variety of interpretations of this jar form. We visited one museum devoted exclusively to mizusashis. And, since they are an integral part of the aesthetic of tea ceremony, they can be extremely expensive and a prized possession. I came back to my studio and made several. It is a beautiful form for creating various storage jars and in the classic shape, makes a very pleasing object to have in your house. 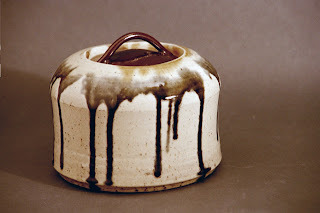 I happened to have some corrupted black glaze that had morphed into a wonderful chocolate brown. It worked perfectly as a substitute for the lacquer lid. This example is quite large. My teabags live in there. The other day it occurred to me that I have total control of what goes into the house. For the first time in I don't know how long, I can LIMIT tha stuff. What a concept. Usually a house is an accumulation of things acquired over many years--things you inherited or bought along life's way. I've always liked the empty, echo-y barren house mode. It brings back Navy transfer memories of the period when you land in a new place and all your stuff is on the moving truck, winging it's way to you. The-camping-out-in-the-empty-cave concept. I still like it. 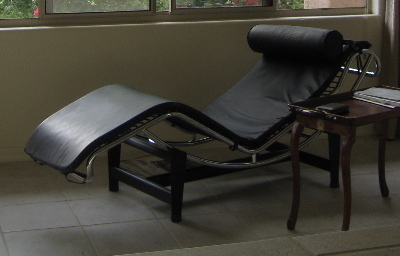 One dismantled Le Corbusie chair.....one of the most comfortable chairs EVER invented. I sat down (reclined-more like) in this chair in a Seattle furniture store and immediately wrote a check. (But I must note, it wasn't anywhere near the designer store price, but much, much cheaper--it's an Italian replica.) It wasn't that hard to shoe-horn this chair into the van, believe it or not. It always was a superfluous piece of furniture in our old house, lounging around in part of the living room looking totally out of place. Is that what they mean by "Casual Furniture?" Something that just lounges around.........casually? Other stuff: Two vintage goose-neck lamps, WWII era ones that I somehow wound up with after about ten years of being an antique dealer. A mahogany drop-leaf table was indecorously bungied and turned upside down with it's horse-like legs in the air and winkled into place behind the driver's seat. My Mac was nestled into quilts and wedged into the cavity of said table and padded with more space bags. (I jammed two bags full of fabric for quilts I've been intenting to make.) We also had the PC that owns my husband, and a few books. We topped the load off with two rugs, a roorkhee safari chair (dismantled and in a bundle) and the caned-seat balloon back chair I just repaired. I did locate a great French bakery with real pate (!) great croissants and baguettes. I think Mr. le Bak-air and I will be seeing a lot of each other. How many croissants can I get on a platter? 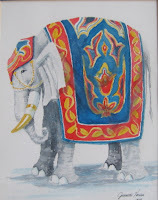 Once upon a time, I was really into painting watercolor elephants. There is a store in London named Thomas Goode, ltd located just south of Oxford Street and Grosvenor Square on South Audley. It's not far from the American Embassy. Flanking the entrance and standing behind huge glass display windows are these fabulous ceramic elephants. You can find more pictures of them on the web at www.thomasgoode.co.uk. The elephants are majolica and were made for the company by Minton around 1898. They stand at about 8 feet tall. They are truly awesome. Inside, the shop and museum seems to go on and on with rooms filled with of the finest examples of ceramics to be seen anywhere. Goode still produces china wares for sale as they have since the early part of the 19th Century. I love paper; especially beautiful paper. I love boxes too. I love making custom boxes. This is another class I took some time ago. I learned how to make boxes from scratch. Using a grey board, I learned to construct the outside, fit drawers and fashion custom compartments. It's a lot like carpentry. 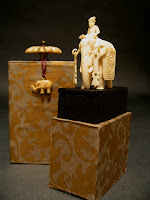 This little treasure is a carved elephant and rider I bought when we visited New Dehli in the '70s. It is such a delicate carving. (The elephant has separate, swingy earrings.) It is only about 1 1/2 inches tall and I've always been afraid it would get damaged. So, I made this keeper box based on a classic perfume box design. I even cut custom recesses in the bottom black mounting piece to fit the outline of the elephant's feet. They fit down into holes that are about 1/8 inch deep. He is kept in with tiny dollops of Museum Gel. On the top is an antique ivory teapot knob I found in an antique store; the little dangling elephant is a family piece--an antique celuloid political token from about 1880-1900. The paper covering the box is made in India. I have many sketches and notes on boxes in my clay files. The same principles of construction apply, with modifications for working in clay. Lana Wilson has written several good articles about how to make clay boxes. I'm particularly interested in figuring out how to make a box with a secret compartment. I've always loved the idea of hidden rooms, sliding panels, puzzle boxes.